Children's Hope International: Happy 2010 Mid-Autumn Festival! The Mid-Autumn Festival, also known as the Moon Festival or Zhongqiu Festival is a popular harvest festival. Chinese, Vietnamese and South East Asian people all over the world celebrate the holiday. The Mid-Autumn Festival is held on the 15th day of the eighth month in the Chinese Lunar calendar, which in 2010 falls on today, September 22nd. This date parallels the autumnal equinox of the solar calendar, when the moon is at its fullest. Eating mooncakes, circular pastries (originally designed to look like the moon) filled with lotus paste and an egg yolk, and drinking tea are two of the traditions that take place during the Moon Festival. One of our Children's Hope families shared their experiences making mooncakes on our main yahoo group. 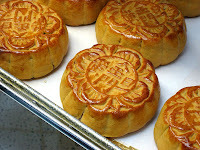 "I use the following mooncake recipe and the 'cookies' turn out well and everyone that tried them really enjoyed them. I found recipe on the Asian for Kids website (link). We used sweet red bean paste that we found at our Chinese market. But if you're in a bind, you can use raspberry jam. I should also mention that the mooncakes aren't the prettiest cookie when all said and done, but they do get gobbled up!" Cory Barron, Development Aid Director at Children's Hope and father of twins from China, says, "If you try bean paste consider adding some brown sugar if you prefer your desserts sweet. Vary your cookies and try chocolate in place of the paste, too. Let us know how your baking goes!" The Mid-Autumn Festival is one of the few most important holidays in the Chinese calendar and is a legal holiday in several countries. The American Consulate in Guangzhou was closed today for the holiday and many Chinese officials are on holiday for several days. Children's Hope has 12 families traveling to China to complete their international adoptions this week, their schedules tailored to the holiday. In country, families celebrate much like Americans celebrate Thanksgiving, as friends, family and relatives gather to share food and give thanks. Children often light bright lanterns creating beautiful landscapes across the country. How do you celebrate the Mid-Autumn Festival with your family?